Welcome to our “All About Reflective Tape” informational website. All the articles on this site are written by Steven Cole. 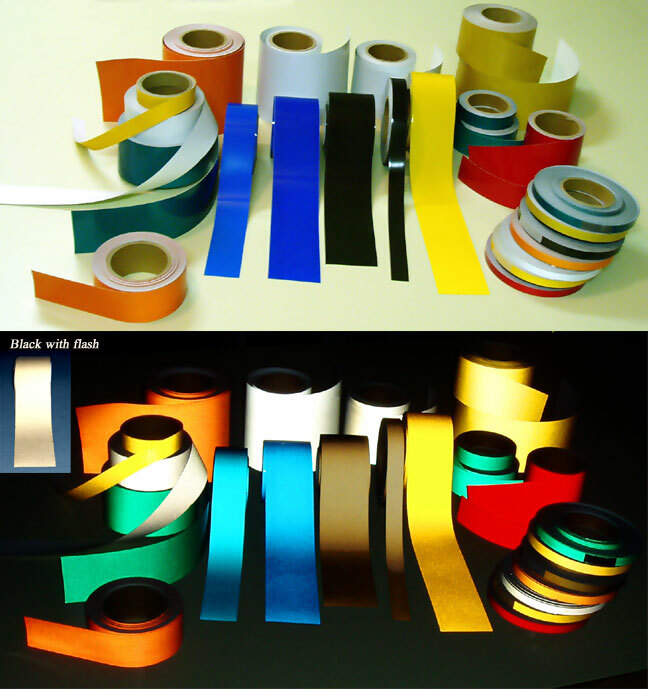 To purchase reflective tape you can go to our Online Store. For more images you can go to our our Reflective Tape Picture Site. For decades, reflective tape has played a major role in enhancing night time visibility and safety. It has saved countless numbers of lives since it was invented in the 1930’s. Reflective tape or sheeting is also referred to as retro-reflective in that it collects and returns light back to the source of that light. In other words, no matter which direction the light comes from, the reflective material collects it, focuses it, and returns it back to the light source. (often an automobile or flashlight) This is done via glass spheres that act as parabolic mirrors or through man made prisms that bounce light back to its source. In our article titled “How does reflective tape work” we show you how the tape is able to do this. Federal C-2 DOT regulation governing the use of reflective tape on tractor trailer rigs. FRA 224 regulations for rail car marking. FMVSS 131 / FMVSS 217 – State and federal school bus marking requirements. ANSI/ASAE S276.7/S279.15 standards for agricultural equipment. Coast Guard SOLAS regulations for offshore reflective applications. MUTCD standards for Minimum Reflectivity for Sign Sheeting on DOT regulated roadways. MUTCD standards for Gate Arms & Railroad Crossings. Corp of Engineers Guidelines for Striping Gates. We have included diagrams, pictures and videos to help you understand how this amazing product works and how it helps us every night to get where we are going safely. If you wish to purchase some reflective tape we have a wide variety at www.tapedealer.com .